Home Antique of the Week	Antique Plant Stand! TGIF, Friends! I am in full Christmas decorating mode. How about you? Yesterday my husband and I went to Lowe’s to pick up a few things and we bought some lovely poinsettias! I knew I needed a large one to go in my favorite antique plant stand. Come see how it looks! I bought this antique plant stand in Doylestown several years ago. It was one of those love at first sight pieces. After it caught my eye, I couldn’t stop thinking about it. But, it was kind of expensive-so I played my game. I left the store and decided if it was still there next week, I’d buy it. If no one else snatched it up, then it was meant to be! As fate would have it, the plant stand was still there. So, I had to buy it. And I’m glad I did! It is one of my favorite antiques! A few of the flowers and leaves got bent during the move, but it just adds to its charm. 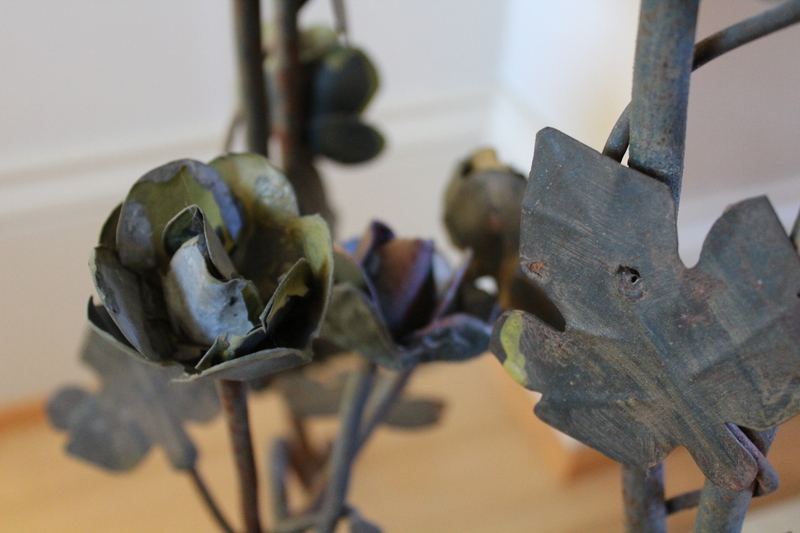 The plant stand has metal leaves and flowers all around the entire piece, including the legs. It stands about waist high, so it makes a nice statement piece. It’s a bit rusty, but I love that too. And because it stays inside, it shouldn’t rust or deteriorate as much as it would outdoors. No need to paint this beauty! This plant stand has such great detail. I wish I knew how old it is, but there are no markings. The red poinsettia looks so festive in the stand! One thing I love about our new house is the neutral backdrop. It looks equally nice with oranges and blacks in the fall, and reds and greens at Christmas. The red poinsettia is from Lowe’s. They have a great selection now of white and red poinsettias and this large plant was only $11.97! So, if you are in the market for beautiful and affordable poinsettias, head out to Lowe’s soon for the best selection! The red ones are my absolute favorite!